It’s no secret that finding the perfect backpack is crucial to any world traveler. Comfort is key and breathability is a must. Long gone are the days when backpacks were tailor-made to fit a man’s needs. Women’s bodies are built differently, therefore we need a form-fitting backpack that’s designed to fit a woman’s curves without digging into our shoulders and chest. Read on to discover the leading backpack companies who have produced the very best travel backpacks for women. Osprey is known for making some of the highest quality products, and they most certainly did not disappoint with their Osprey Sirrus 36 Travel Backpack. It is truly amazing at how many features they built into this one backpack, making it a strong competitor in the lineup for best travel backpacks for women. Made of 210D and 420D nylon dobby. Side mesh pockets are equipped with InsideOut compression. Adjustable and removable sleeping pad straps. Sleeping bag compartment with divider. 3D tensioned, breathable mesh back panel. Airspeed Suspension uses a LightWire alloy frame. Perfect for day and overnight trips. Integrated raincover protects your gear. Several pockets make it easy to organize. Includes an ice tool loop. Evenly distributes the weight of the pack. Troublesome pull to release drawstring lock in main compartment. Raincover may not cover both the bag and sleeping pad. The Kelty Women’s Redwing 40 Backpack was designed to comfortably fit the curves of a woman’s body. The latest model has improved on comfort and design. This backpack has a simple design but is built to last. Holds up to 40 liters. Can be used as a carry-on. Perfect for two week trips. Comes in visually appealing colors. Very spacious, with multiple pockets. Hip belt is difficult to remove. Does not adjust to a small enough size for petite frames. Lacking internal straps or mesh. 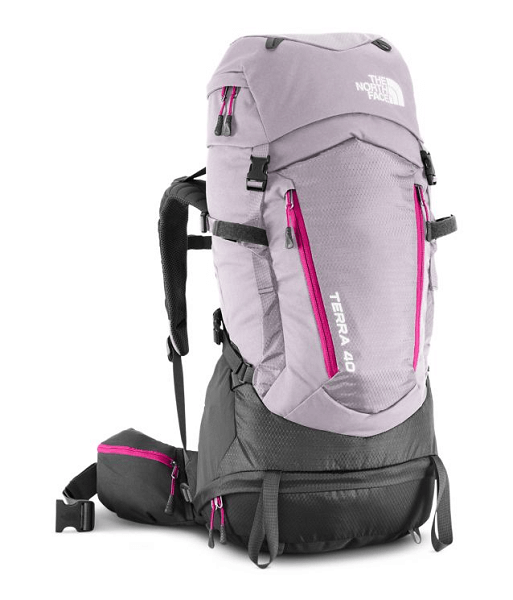 The North Face Women’s Terra 40 Travel Backpack is one of the best travel backpacks for women who are backpacking over the weekend or taking slightly longer trips. 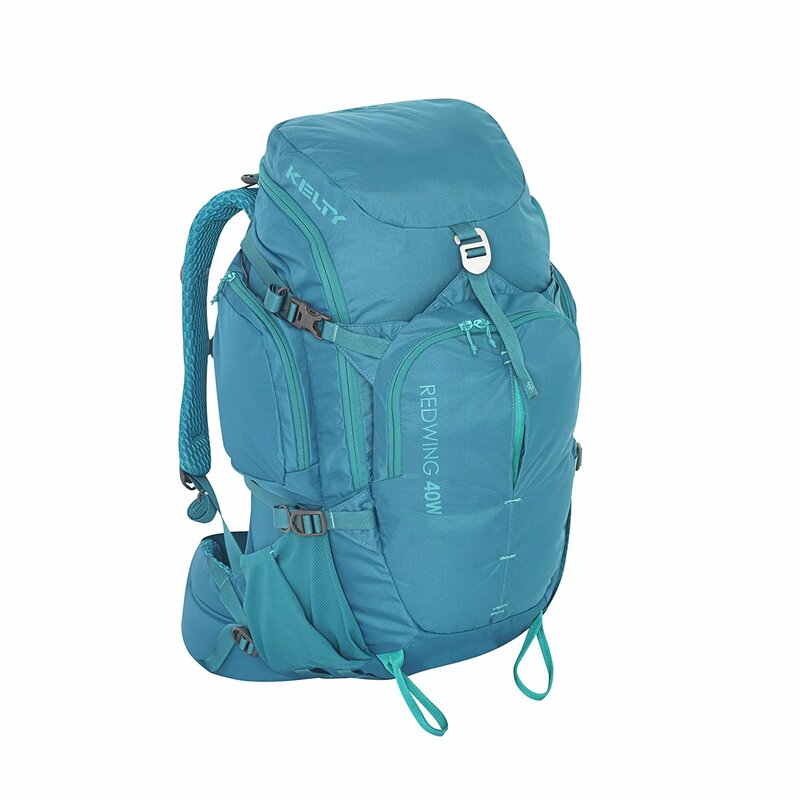 While the pack is large enough to hold more gear, it was specifically designed with hikers and backpackers in mind. Vertical channel provides improved ventilation. Made of 420D mini-ripstop nylon, 600D polyester and 1200D polyester. Load-spreading soft air mesh hip belt. Visually appealing design and color scheme. Perfect for two to four day trips. Is difficult to load and unload. Material can irritate bare shoulders. 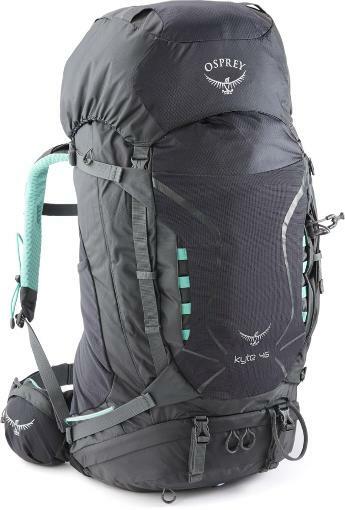 The High Sierra Women’s Summit 40 Hiking Backpack is one of the better bargains you can find when searching for the best travel backpacks for women. This backpack has an incredible number of features and seemingly endless positive customer reviews. The only warning customers give is that you compare the measurements of the backpack to your own body measurements before ordering. Airflow channels in molded foam back panel. Water sleeve with dual exit ports. Padded straps and adjustable load lifters. Adjustable waist belt with Hex-vent mesh padding. Daisy chains on both sides. Soft lashing hardware to hold poles and ax. Works wells as a carry-on. Perfect for three to four week trips. Several compartments makes it easy to organize. Shoulder straps are too close together and tend to rub. Many women have issues with the chest strap. Osprey designs some of the greatest travel products and deserves a seconds spot on the list of best travel backpacks for women. 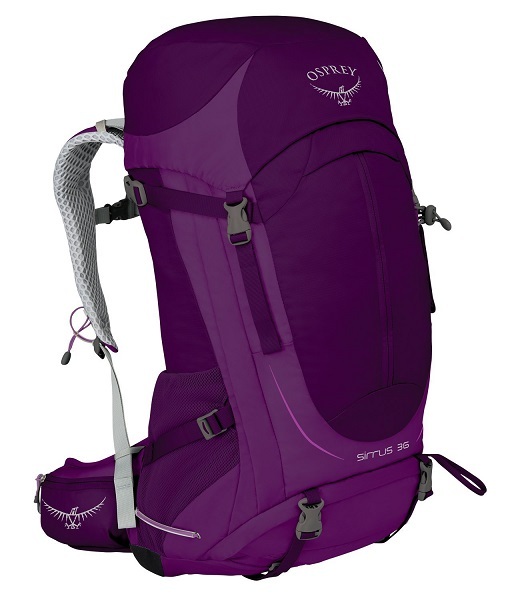 Osprey Women’s Kyte 46 Travel Backpack is specifically designed for female backpackers. When using packing cubes, several customers are able to pack up to a week’s worth of clothes and overnight gear into the pack. Sleeping compartment with a divider. Multiple zippered and mesh pockets. Fixed top lid with web attachment. Holds up to 46 liters. Opens from the top, bottom and side. 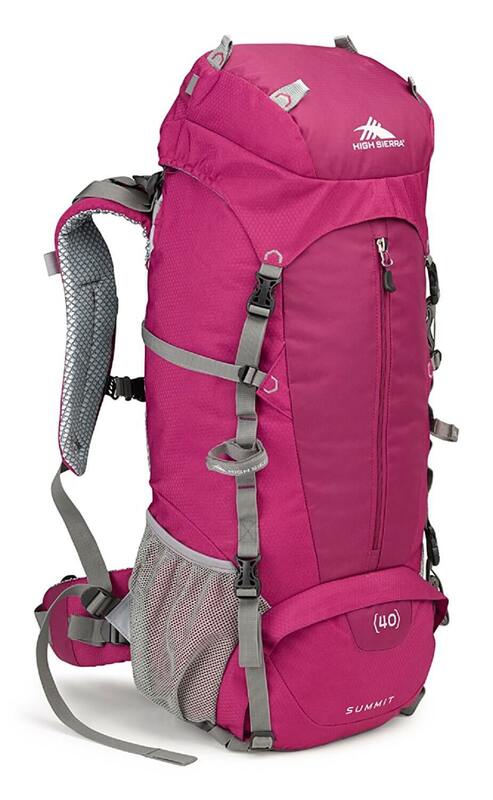 The Deuter ACT Lite 45 + 10 SL Hiking Backpack was designed by women, for women. The backpack is quite a bit more adjustable than most, easily fitting most frames. Aside from being highly adjustable, the Deuter backpack is more breathable and form-fitting than most. 15% less perspiration than with other packs. Light, flexible and stable internal frame. X-frame and hip wings transfers weight to hips. Specialized compartments for poles, wet gear and clothing. Can work as a carry-on if the 10L and top portions are left empty. Adjusts to fit different frames. No staps on the bottom for a sleeping pad. Does not work as a carry-on when packed full. 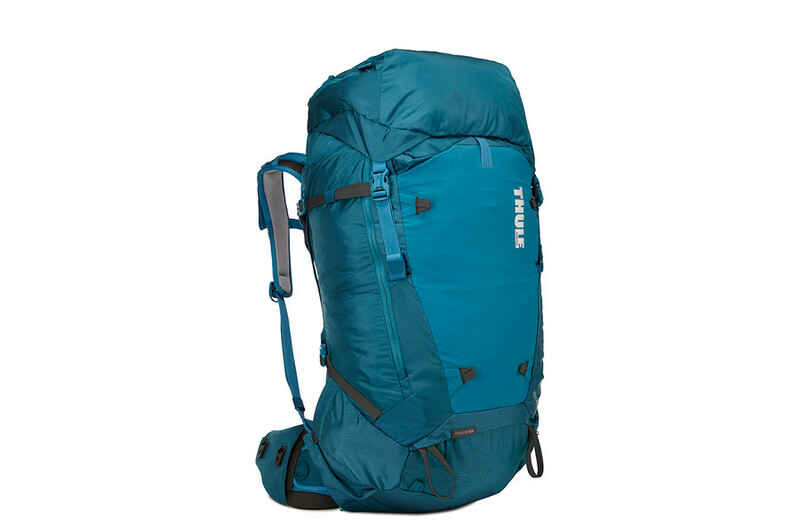 The Thule Versant 60L Women’s Backpacking Pack is a fierce competitor in the lineup of best travel backpacks for women. This roomy backpack, ideal for three to five-day adventures, is fully waterproof and made of the highest quality materials. Thule has perfected the art of combining comfort and versatility in a backpack that is a world traveler’s dream come true. Custom hip belt with three interchangeable pockets. Top lid converts to a sling pack. Adjustable hip belt and torso. Breathable shoulder straps and back panel. Effectively transfers weight to hips. Accessible from top and sides. Easily accessible compartments on the go. Comes with a demo video on a thumb drive. One of the more expensive tavel backpacks on the market. The Gregory Amber 60 Travel Backpack is ideal for backpackers and those traveling for months at a time. It is large enough to pack enough clothes in to wear for months on end. Alternatively, it has all the compartments and features needed to spend a week living in the wilderness. TrailFit hipbelt adjusts up to 6 inches. SideTrack can be used as either a daypack or hydration sleeve. Can pack up to 70 pounds. Can be “lived out of” for up to a month. 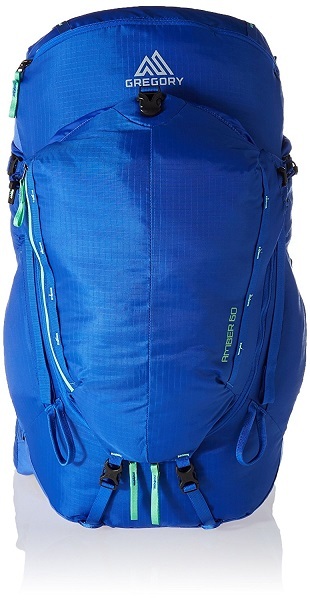 Runs smaller than other Gregory packs. When shopping online for the perfect backpack it is important that you remember to reference size and measurement charts. No two companies make their backpacks the same, and it is not uncommon for torso lengths to vary from pack to pack within the same company. From overnight treks to month long adventures, the leading companies have created the best travel backpacks to fit every need.